AMES, Iowa — A research team led by Iowa State University has solved part of a mystery important to battling the most serious threat to U.S. soybean production, the soybean cyst nematode — a pathogen responsible for more than $1 billion in reduced yields each year in this country alone. Cyst nematodes are tiny, but powerfully destructive plant pests. The scientists discovered an important mechanism that allows parasitic cyst nematodes to reprogram cells in a host plant to enable their parasitism. A preview of the team’s findings have been posted online by the prestigious journal, The Plant Cell, at http://www.plantcell.org/content/early/2018/10/18/tpc.18.00570. The full article, “An Effector from the Cyst Nematode Heterodera schachtii Derepresses Host rRNA Genes by Altering Histone Acetylation,” will appear in an upcoming issue. The research was led by Paramasivan Vijayapalani, assistant scientist in the Department of Plant Pathology and Microbiology, and Thomas Baum, Charles F. Curtiss Distinguished Professor in Agriculture and Life Sciences and chair of the Department of Plant Pathology and Microbiology, Iowa State. The team also included Terek Hewezi, associate professor in the Department of Plant Sciences, University of Tennessee, and Frédéric Pontvianne, scientist at the Centre National de la Recherche Scientifique and the Université de Perpignan in France. The research team studied this soybean pest’s close cousin, the sugar beet cyst nematode, often used for molecular research because it infects the model plant Arabidopsis thaliana, also known as mouse-ear cress. Since it has been more thoroughly characterized at the cellular and molecular levels, this tiny plant offers many research advantages for scientists, allowing faster progress than studying the soybean or other plants that cyst nematodes parasitize. Cyst nematodes are sedentary — they do not kill plant cells and then move on. Instead, these parasites take up residence and feed off the same group of root cells, weakening the plant and reducing productivity, usually without killing the plant. For this mode of parasitism, the nematodes need to reprogram infected root cells into a specialized feeding structure that can nourish the parasite throughout its life cycle within the plant. While it has been known that cyst nematodes create these feeding sites inside plant roots, how this happens remained a mystery until now. “Our key finding is a mechanistic understanding of one way the nematode alters the activity of plant genes. This is required to direct development of the feeding site within the plant root,” said Baum. “The nematode injects a mixture of proteins into plant cells. 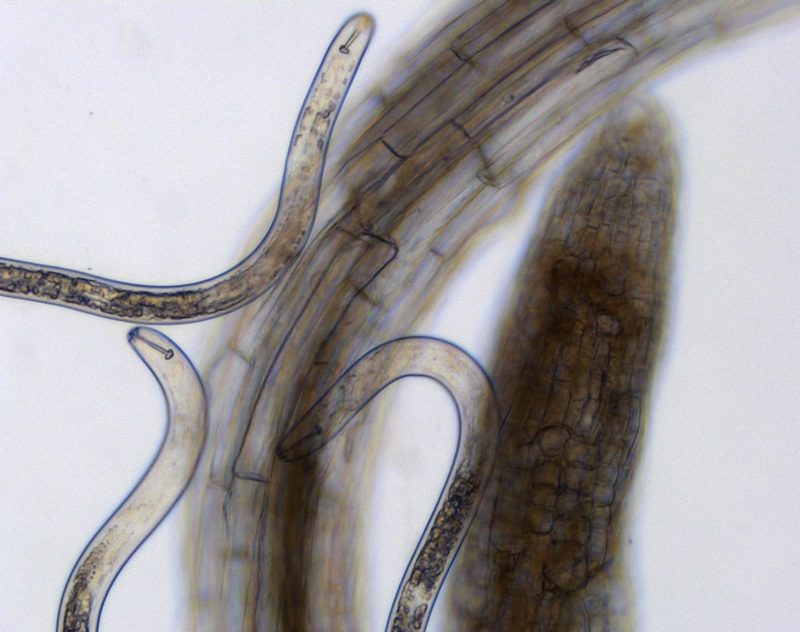 We discovered that one of these nematode proteins alters the conformation of the host plant’s genetic material, redirecting the plant’s gene expression machinery to enable parasitism. This research was supported by Hatch Act and State of Iowa funds, soybean checkoff dollars through the Iowa Soybean Association and the North Central Soybean Research Project, the USDA National Institute for Food and Agriculture – Agriculture and Food Research Initiative, and the French Laboratory of Excellence. The Plant Cell, published by the American Society of Plant Biologists, is one of the top journals publishing primary research in the plant sciences. It publishes novel research of special significance in plant biology, especially in the areas of cellular biology, molecular biology, biochemistry, genetics, development, and evolution. The primary criteria for publication are that articles provide “new insight that is of broad interest” to plant biologists, not only to specialists. Parasitic cyst nematodes, a major pest of soybeans and other crops, cluster around plant roots. Photo by Tom R. Maier, Iowa State University.